Top sales award winners for Charter Business were honored with an all-expense-paid trip to Costa Rica in 2016. Their commitment and persistence allowed the company to meet the sales goal of $2 million in new business. This sales milestone was a new high point for the company. The leaders at Charter Business wanted to express their gratitude with an award and trip that mirrored the depth of their pride. In addition to the trip, 10 deserving recipients were given the award pictured here. 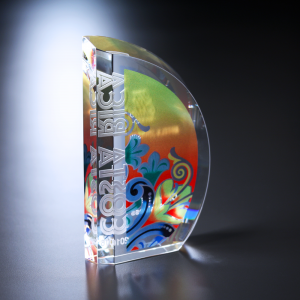 The awards were decorated with a stunning deep etch and 4-color Illumachrome™ accent. 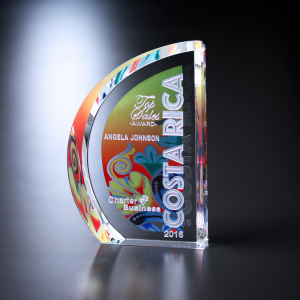 The colors chosen for this design actually mirror the common hues seen in the Costa Rican landscape. Accordingly, the award was meant to remind the winners of their achievement and the thrill of a tropical retreat. The three images are shown here display this award from front, side, and back. As you can see, the front view shows the deep etch imprint while the four-color Illumachrome™ image rests vibrantly in the background. The side view allows you to see the semi-transparent Illumachrome™ image. Last, the rear view shows the complete Illumachrome™ image and the deep etch now resides in the background. 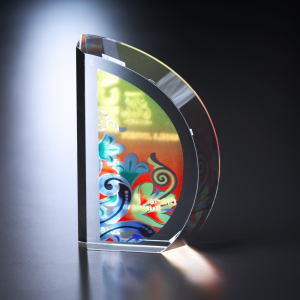 Every side of this award offers something eye-catching and worthy of a long gaze.